Hi everyone, hope you had a Merry Christmas! 😀 2014 is coming to an end, and like with every year end, I post a year-end review to round up my year and encourage you guys to do the same. This year’s review is coming early as I’ll be kicking off a new challenge (Live a Healthier Life Challenge!!) on new year’s eve, but more on that later. Despite my work-related goals for 2014, this year turned out to be a sabbatical year. Namely because most of my time went into first my wedding, then house moving, then easing into my new life with Ken as a married couple, then adapting to life with two cats, and then unexpectedly falling sick for the whole of December. Let’s start with my wedding. 🙂 After months of meticulous planning, I’m proud to share that I got married on May 25 this year with my soulmate Ken Soh in an exclusive ceremony in Shangri-La. 🙂 The wedding was perfect and every bit our dream wedding (really, that we’re marrying each other already makes any setup our dream wedding), though there were hiccups that made me discover new things about people in general (which I’m sure every wedding couple goes through). 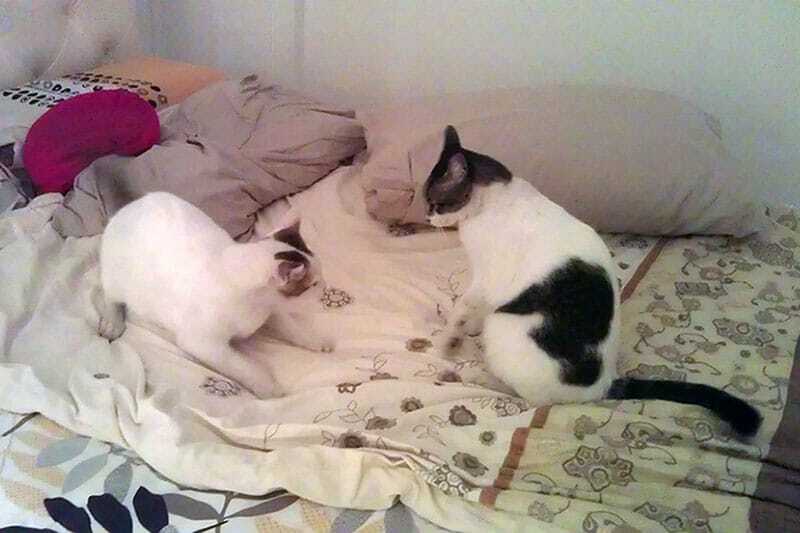 Our cats: Kiki (on the left) and Nancy (on the right) in one of their usual sparring matches. 🙂 Kiki likes to wave his tail rapidly, so you can’t see it here (it’s a blur). They are really beautiful and handsome cats, only a year old each! And it wasn’t that I didn’t have the time (I always think of us having the same amount of time as Einstein or Oprah) but that I had been facing too many distractions. What do I mean? When I started my blog/business in 2008, my vision was clear: to reach out to everyone in the world and lift them up to their highest potential. This vision remains the same today and it has been clear to me every day for the past six years. In the beginning, I dealt with these distractions pretty well by having tighter guidelines on my contact page, having a FAQs page, limiting my communication channels (switching from a Facebook profile to a FB page for one), having a system of email filters, saying no often, having tight spam filters in my comments form, and so on. While distractions would still “leak” here and there, I could quickly clear things up by being efficient. However, over the years, more and more distractions began to “leak.” Every time they did, I would try to mitigate the leaks. But then, more would come. And more. And more. And more. To the point where I became so busy dealing with these distractions on a daily basis that I no longer had time mind space for my high-level work. More importantly, it reached a point where I became afraid to grow my blog further, because I felt the more I cared and the more I grew PE, the more comments / requests / “noise” I would receive, and the less time I would have for anything in my life, including myself and my needs. As I think back, I realize my problem is that I have exceeded this number since long ago. If you think about it, the very essence of my work involves connecting with others and uniting the world as one. With every person I connect with (be it a reader, a client, a workshop/course participant, etc. ), I will always make an effort to build a deep personal connection with him/her and help the person where I can, in my capacity. If you consider the number of coaching clients I’ve had before (that’s several hundred), workshop participants (easily in the thousands range), and readers (gosh, where do I begin? ), that easily adds up to at least 10,000. And I haven’t even added my own family members, close friends, friends, ex-colleagues, PE forum community, and people I’ve met and built a close relationship with during my travels, which easily add up to 400–500. So then, I began to experience a system overload in terms of my relationships. This probably started about 2012, and began to build up over the years. Suddenly, I began to have requests flying in left right and center (be it requests for help, requests for collaboration, requests for my time, etc. ), all of which I felt I needed to address with certain detail in other not to let the other person down. Suddenly, I felt like I needed to care about every single person whom I’ve crossed paths with (say a past client, a past workshop participant, a reader, or acquaintance), or I’ll be neglecting my mission. Suddenly, I felt like I needed to care about anything and everything in the world, or I’d not be living true to myself and my values. The result is that it nearly drove me to insanity. And also caused me to neglect the biggest relationship of it all: my relationship with PE, i.e. my relationship with you guys. And this is a problem. A big problem. For you guys are the reason why I started all this, why I started this platform: to help everyone grow and to achieve our highest potential. And while I’ll still endeavor to be there for anyone who seeks my help, I’ve realized that amidst it all, I must never neglect this utmost precious relationship between me and you guys. Because if PE ceased to exist, then how were we to continue to grow together and support each other in life? Now as I continue to reach out to more people, more distractions will probably follow. But that’s okay. The difference now is that I now know these distractions aren’t the key. Even if I am to get 100 or 1000 distractions next week, they should never take up the bulk of my time or mind space — building PE and creating high-value content for you should. The second important realization I’ve come to is that having these distractions isn’t necessarily a bad thing. While I used to think of the distractions as exhausting, I now realize that they are simply a natural consequence (an easter egg as I mentioned in my incubation period post) from making some headway in my path. As opposed to resisting the “distractions,” I should embrace them and recognize them as part of the journey. I can never please everyone. Start with myself and my mission, and work my way from there. Always do my best in everything, but never neglect my core in the process. The distractions I’m facing are just a natural consequence of growth and success in my path. Do not resist them; rather, accept them as part of my reality. Realize they are really positive indicators, not negative ones. My core is and should always be to build new content and to share my best insights on growth with the world, because it’s the heart and soul of what PE is about. This brings me to my goals for next year. 😀 While I’ve multiple PE goals, I’d say they all ladder up to this one big goal: to create new content not unlike my initial years. I plan to be creating content in two main forms: articles and videos. If you guys have been following my past annual reviews, I started living a life of intuition since 2012. Meaning no specific goals, just living by intuition and intention. And while this has really helped me to live in the now and be more conscious to the world out there, ultimately I have realized that living a life of maximum fulfillment and results is about both embracing our intuition AND setting hard goals based on our highest vision. That’s because while being in tune with our intuition helps us to stay connected with our higher thinking and remain in our highest consciousness, it’s our goals that help us to channel our energy into creating concrete results. In the meantime, I’m proud to announce my first initiative of 2015 which will be a 14-Day Healthy Living Challenge for Jan 2015!! Healthy Living Challenge is a challenge I started in 2011 with much success, conducted again in 2012, but didn’t do so for 2013 and 2014 as I had other things going on then. Now, holiday season is one where most of our diets and exercise regimes fall off track, so if living healthier is in line with your personal goals, you need to be a part of this. Get the details and sign up free here: 14-Day Healthy Living Challenge, Starting Jan 1! 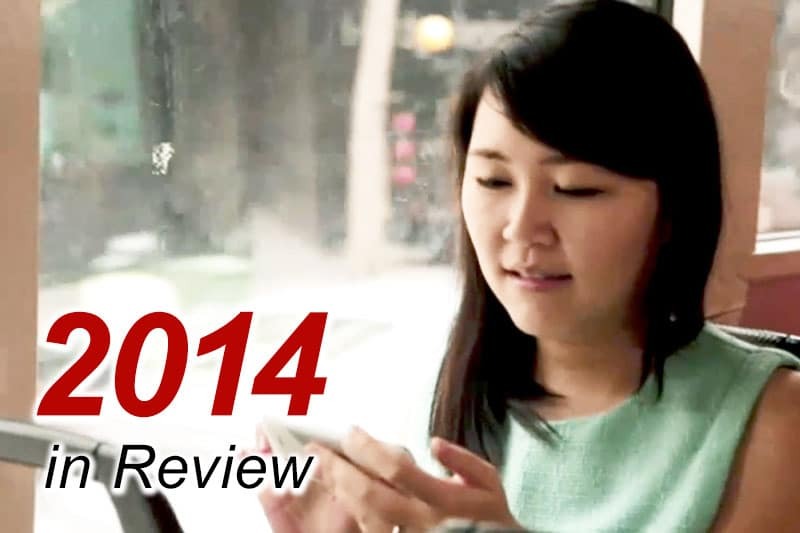 How About You: Have You Done Your Year-End Review? A year-end review is great to reflect on how your year went, identify lessons for the future, and set new goals for the new year. If you haven’t done yours, I encourage you to do so. How did your 2014 go? What are your key lessons for the year? What are your goals for 2015?